L’Oreal is one of the premium personal care products in the world, and the L’Oreal Paris Men Expert X-Treme Hydra Energetic Charcoal Face Wash is one of the best cleansers for your face out there for men. This face wash acts likes a magnet to capture dirt, glime, and oil which cut build up to help prevent blackheads and reduce shine on the skin. Every man needs a good face wash for daily use so they don’t have a build up over time which would lead to pimples and clogged pores. It is one of the top 10 best selling men’s face wash products online, and on Amazon. It has 4.2 out of 5 stars with 82% fours stars or higher. It comes out as a kind of paste like wash, but turns into to a foam which worked together in your hands. The majority of reviews say it leaves your face feeling soft and clean after use, but a few said they product did not help them to cleanse their pores out very well. It takes very little of the Charcoal Face Wash on each use, because of how much it lathers up, which allows you to use the product for a while. It is gentle enough to use on your face daily. Reviewers with oily skin commented this product has worked well for them to reduce the oil, and keep their blemish level down. This product should work well for many skin types out there like oily and sensitive. Even if you have a beard, mustache, or goatee you still need to wash the rest of your face and this is a great face wash for that. 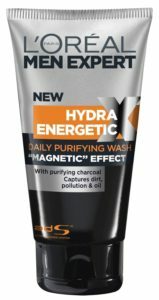 Overall, the majority of reviews are the L’Oreal Paris Men Exper Hydra Energetic Face Charcoal Face Wash is a great face wash which is what you need plain and simple.